Our estate comprises just over three hectares of vineyards. The "Abelardo" Orcia DOC comes from vines grown at an altitude between 240 and 270 meters above sea level, whereas the Brunello DOCG and the Rosso di Montalcino DOC are grown in east to west facing vineyards at an altitude between 260 and 300 meters, where exposure to the sun is at its highest. 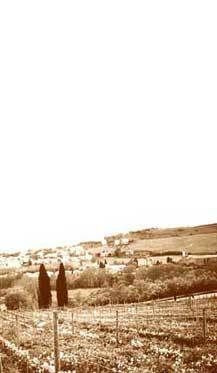 The vineyard covers ground that was once exploited for its clay. Over the years, the clay pits were filled in with residual soils and humus, such that today the vineyard is like a concentration of all the geological types of the area, duly amalgamated by the passage of time. This makes for a uniquely interesting micro- environment. Scrupulously selected vine stock (420A, 1103 Paulsen, S04) a planting grid of 2.80 x 0.80 and a density of 4450 vines per hectare have proved to be ideal for the development of Sangiovese, known as "Brunello" around Montalcino. The vines are trellised following the spurred cordon technique, in keeping with local practice, and at the end of the winter they are pruned short, leaving only two buds per branch. In summer, the bunches of grapes are thinned out so that those remaining ripen evenly and fully. The yield per hectare thus falls well within the parameters established by the production rules (max. 8000 kilos of grapes per hectare). The vines are cultivated entirely by hand, largely by the owners of the estate. No chemical fertilizers are used. Instead, the soils are enriched by sowing leguminous plants between the rows of vines.